When we last saw the young women of “Riverdale,” Polly Cooper was going to stay with Veronica’s mom – Hermione Lodge. But, as the show returns to The CW on Thursday, don’t expect the mom of the pregnant teen, Alice Cooper, to embrace the move. 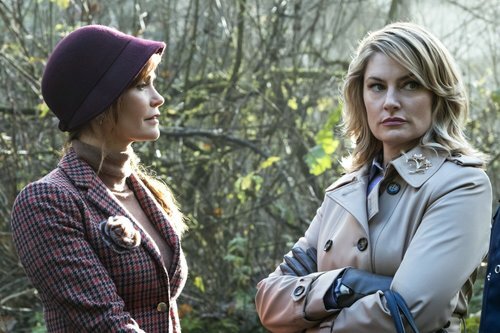 We know there’s history among the parents of “Riverdale,” but don’t expect Alice and Hermione’s own high school past to come up during this sitdown like it did for Fred Andrews and FP Jones in a recent episode. WATCH: ‘Riverdale’s’ Lili Reinhart Talks Classic Archie Comics Opener, Betty & Jughead’s Second Kiss! One history that’s already been established is the long-running feud between the Coopers and the Blossoms — over a maple syrup dynasty. Alice’s husband Hal was born into that particular conflict, but is Alice too harboring the grudge? And what’s her role in keeping that feud going? Within all the drama, there is some light. Alice Cooper is on board with her daughter Betty’s romance with Jughead Jones! While Betty hasn’t come out and told her mom she’s dating FP II, Alice is aware and kind of ships it. “Riverdale” continues Thursday at 8/7c on The CW.